The most recent flooding events in British Columbia and New Brunswick have proven how vulnerable and unprepared both residents and the government are, experts say. Many Canadians continue to live in high flood risk areas without being aware of the danger, while government officials have yet to implement proper zoning restrictions in such risky areas. 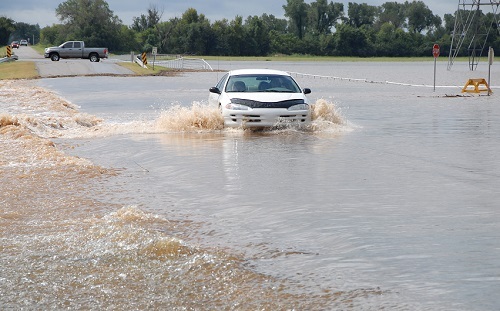 One expert says officials can no longer afford to play coy when it comes to flooding, and should be more forthright with residents on flood plain information before it is too late. "The most recent flooding in New Brunswick and south-central British Columbia are reminders we can no longer 'cheat the system' on flood risk," environmental scientist Blair Feltmate told CBC News. "Cheating has caught up to us." Feltmate, who leads a federally-appointed panel studying climate adaptation and is the head of the Intact centre of climate change at the University of Waterloo, explained that as the floodwaters recede in BC and NB, everyone needs to stay focused on preparing for the next flooding. "Every day we don't adapt is a day we don't have," he said. The scientist is one of several other experts advocating for easily-accessible, high-resolution flood risk maps, zoning rules that prevent development in vulnerable areas, and support for flood-affected residents. According to Feltmate, basic basement floods have become the single largest cost of climate change-related damage in Canada; his research institute has projected the average basement cleanup costs $43,000. Daniel Henstra, a senior fellow at the centre for international governance innovation at the University of Waterloo, also shares Feltmate’s views that the government needs to do more to help residents mitigate flood risks. He said that the recent floods demonstrate that homebuyers currently do not have access to "an effective system to make people aware of their property's flood risk." Henstra added that in addition to access to flood maps, there is a need for "clarity on who should be responsible for disclosing flood risk and when."